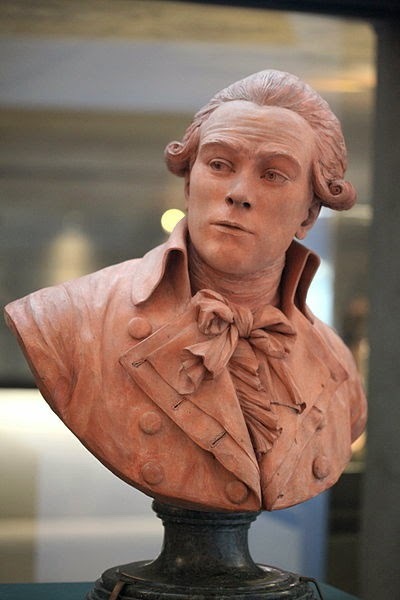 This beautiful terracotta statue of Robespierre, on display in the Musée de la Révolution française at Vizille, is identified today as the work of the sculptor Claude-André Deseine. It is recorded that on the evening of 18th December 1791 Deseine presented this bust, together with one of Pétion, to the Jacobin Club which had recently elected to adorn its meeting room with sculptures of "champions of liberty"( Rousseau, FrankIin, Mably, Price and Mirabeau). Members were at first enthusiastic, then one of their number recalled that a month previously it had been decided that no living citizen could have their effigy displayed. Robespierre himself remained silent all this time, but seemed impatient to resume discussion of the war and to deliver the speech he had prepared. In April 1792, however, he recalled with approval to the provincial Jacobins the ruling of the Paris society. How good a likeness is it? Presumably there were no formal sittings; Deseine based his work on observations of Robespierre at the Assembly. 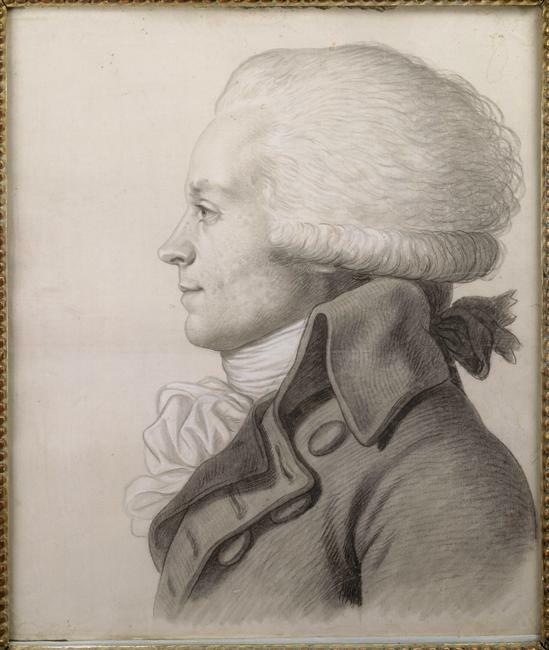 Philippe Bordes, "Le robespierrisme de Jacques-Louis David" in Annie Jourdain, Robespierre: figure-réputation (1996) [Google eBook] p.131-2. That is an incredible work: it's so lifelike. The furrowed brow, the expressive eyes… While Deseine has smoothed out the smallpox scars (which nearly everyone had in those days, so would not have been that noteworthy), it is recognisably Max: compare the drawing by Boze. I think terracotta is a superb medium for creating that sense of immediacy. One feels this is a real, breathing person, about to say something: the intelligence and energy come through. And it makes a huge difference to see someone in 3D, when you've always only seen them in 2D. PS: It's a pity that photo of the Conciergerie copy is so badly lit: it makes the detail hard to 'read'.